The White-eyed Conure usually nests in a high tree cavity but may also nest in limestone caverns, particularly in Brazil. P.l. leucophthalmus: Both adults in general green, with variable scattering of red feathers on head and neck; red carpal edge and edge of forewing; red outer lesser underwing coverts, green inner coverts; yellow outer greater underwing coverts, olive inner coverts. Bill horn in colour. Eye ring bare and white. Eye orange. P.l. callogenys: Both adults as in leucophthalmus, but with larger bill. Larger in size. Western birds have darker green body colour. P.l. propinquus: Both adults as in leucophthalmus, but larger in size. P.l. nicefori: Both adults as in callogenys, but in general body colour paler and more yellow; red stripe across forehead. P.l. leucophthalmus: As in adults but with yellow/green carpal edge and edge of forewing, suffused with red; olive/green outer greater underwing coverts; red feathers on head and neck minimal or absent. Shorter tail. Eye brown. Calls made in flight are repetitious and sharp, almost metallic, notes. Also emits scolding and grating sounds, and more melodious notes. Fruits such as: apple, pear, banana, orange, cactus fruits, pomegranates, forming about 30 percent of the diet; vegetables such as: carrots, celery, green beans and peas in the pod; fresh corn; green leaves such as: Swiss chard, lettuce, sowthistle, dandelion, chickweed; spray millet; small seed mix such as: millet, canary, and smaller amounts of oats, buckwheat, safflower and a little hemp; soaked and sprouted sunflower seed; cooked beans and pulses, boiled maize, and complete pellet. Provide water bowls for bathing; swings, ladders, ropes, puzzle/foraging toys, vegetable tanned leather chew toys, bird-safe wooden toys; fir, pine and willow branches and perches, heat sterilized pine cones. High volume of international trade, particularly in Argentina, where the species may be under some threat. P.l. leucophthalmus: Guianas, NE Venezuela, from SE Sucre, Monagas, and N Anzoategui to NE Bolivar, and E Colombia, south from Meta, south through Brazil, except upper Amazon River basin, dry northeast and southeast, to E Bolivia, Paraguay and N Argentina, south to Catamarca and N Sante Fe and Entre Rios and into N Uruguay. P.l. callogenys: Upper Amazonia, near foothills of Andes, in SE Colombia, E Ecuador, and NE Peru to NW Brazil. P.l. propinquus: SE Brazil in Santa Catarina and Rio Grande do Sul, to NE Argentina, in Misiones and Corrientes. P.l. nicefori: One specimen collected at Guaicaramo, on Rio Guavio, Meta, Colombia. Possibly a hybrid. Found up to 2500m (8200 ft) in a range of mainly lowland forest and woodland types. In Amazonia is found in tropical rainforest mostly near to rivers, scattered woodland and cultivated land in the pantanals, mangroves, savanna and palms; chaco woodland in the south, gallery and floodplain forests in Bolivia. Feeds on fruits of palms, nuts, seeds, other fruits, berries, flowers and insects. Very gregarious, commonly forming flocks of several hundred birds which range widely along riverways between feeding areas and roosts. Roosts communally in trees, canefields and caves. 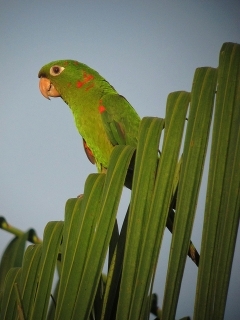 Travels with Blue-crowned Conures, Blue-headed Parrots, Chestnut-fronted Macaws and Crimson-bellied Conures. 4 eggs, 31.0 x 25.0mm (1.2 x 1 in). November-December, Argentina; July-August, E Peru; January-April, Mato Grosso.